Michael C. Thomsett writes: The hardest part of learning about options trading strategies is getting used to the language. Once you nail that, you're most of the way there. Here are the terms you are going to need to learn to understand and use options. Keep in mind that the best way to master jargon is by applying it in real situations. Let's jump right in by first explaining puts and calls. These are two of the key fixed ingredients of an option - fixed, meaning they never change. They tell us what the option stands for and what it is worth. A call is a contract that gives its owner the right to buy 100 shares of stock at a fixed price (known in advance). A put is just the opposite, and completes the transaction. It's a contract giving its owner the right to sell 100 shares of stock. These concepts are the keys to exactly what an option is. An option is a contract granting you as buyer control over 100 shares of stock. This is always the case - one option per 100 shares. b) You can sell the call and take a profit (the profit comes into the picture when the stock rises, making the option more valuable, too). a) You can exercise the put and sell 100 shares at a fixed price per share. b) You can sell the put and take a profit (the profit is there if the stock price falls, making the option more valuable). Every option controls 100 shares of a specific stock, index, or fund. This is called the underlying security. It cannot be changed during the lifetime of the option, and options are not transferrable. By the way, we in the biz often just call this asset the "underlying," so be ready to hear that. Every option has an expiration date. That is the third Saturday of the expiration month, but the day before (the third Friday) is the last trading day, since the markets are closed on Saturdays. After expiration date, the option no longer exists. Finally, there is the strike price, which is the fixed price per share of the underlying. If an option's owner decides to "exercise" (meaning he decides to buy 100 shares through a call, or to sell 100 shares through a put), the strike is the fixed price. These four standardized terms define each and every option and, collectively, set them apart from one another. Again, none of the terms can be changed or transferred. If you have an open options position and you want to make a change, you need to close it and replace it with a different option. All four defining terms are expressed in every option listing. 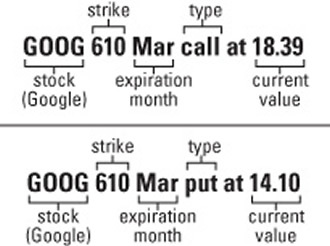 Take a look at this figure showing the collective terms for a call and a put on Google Inc. (NasdaqGS: GOOG). Note that all of the terms are highlighted: Type (call or put), underlying security (Google), expiration date (March 2012), and strike (610). The listing also summarizes the current value for each option. Here, the call's value was 18.39 (or, $1,839), and the put was valued at 14.10 ($1,410). This next set of terms describe how options act, as well as how they change in value, based on the distance between the current price of the underlying, and the fixed strike price of the option. 3.The level of volatility in the underlying security. The greater the volatility, the higher the risk, and the higher the option's premium. Options are subject to exercise - remember that word? - meaning the owner has the right, at any time before expiration, to buy (through exercise of a call) or to sell 100 shares (through exercise of a put). The owner will buy only if the underlying security's current value is higher than the strike of the call, or sell only if it is lower than the strike of the put. By exercising the call, the owner buys 100 shares below market value; by exercising a put, the owner sells 100 shares above current market value. If the stock's price is lower than the call strike or higher than the put strike, there is no risk of exercise. It just wouldn't make sense to pay more for a security than market or to sell it for less. Exercise can also occur automatically, but only on the last trading day before expiration. On that Friday, the Options Clearing Corporation (OCC) automatically exercises all calls when strike is below current value of the underlying, and automatically exercises all puts when strike is above current market value of the underlying. This condition - with the call strike below current value of the underlying, or the put strike above - is referred to as in the money (ITM). This distinction is of great interest to anyone who has shorted options, because with the status of being ITM comes the risk of exercise, which can occur at any time. It is also a key attribute of owning options. When an option is in the money, the premium will move point for point with changes in the underlying security. When the current value of the underlying is below the call's strike (or above the put's strike), its status is out of the money (OTM). In this condition, there is no immediate risk of exercise and the option premium will be less responsive to movement in the underlying. The degree of change relies on the same three factors (price distance, time until expiration, and volatility of the underlying). One final definition (and it'll make perfect sense to you now). When the current value of the underlying and the option's strike are identical, the option is at the money (ATM). While this condition does not usually last long, it is a benchmark for identifying how value changes. Comparisons of option premiums often are based on assumed value when ATM. Remember, the option's premium is based on the proximity between strike and current value of the underlying, the time remaining to expiration, and volatility (another word for market risk). Intrinsic value is the part of option premium equal to the points "in the money." For example, if a 35 call is valued at 5 ($500) and the current price per share of the underlying is $37, then the call is two points in the money (37 - 35). So the call has two points of intrinsic value (and three points are something else). For a put, the same rule applies - just in the opposite direction. Let's say a 40 put is valued at 3 ($300), and the current price per share is $42. The put is two points in the money, so there are two points of intrinsic value included in the premium. (The remaining point, again, is a different kind of value). If an option is at the money or out of the money, it contains no intrinsic value. Next up is the time value of the option premium. Now, a lot of people consider time value as comprising the entire option premium except intrinsic value. But that's not quite true. Strictly speaking, "time value" relates solely to the degree of an option's premium based on time remaining until expiration. Time value is very predictable. The longer the time remaining until expiration, the higher the time value. The closer expiration gets, the more rapidly time value falls (this is called time decay). At the point of expiration, time value has fallen to zero. As you can see, both intrinsic and time value are extremely predictable; they can be estimated based on price proximity and the date. The third portion of an option's premium is where all of the uncertainty resides. Extrinsic value - also called an option's "implied volatility" - varies based on proximity, time, momentum in the underlying, and the underlying security's own volatility (its historical volatility). It's complex to calculate, but extrinsic value is easy to observe. If you just look at the entire option premium, minus intrinsic value, that leaves time and extrinsic value. Time value can be estimated based on time remaining, and whatever is left over is extrinsic. 1.When expiration is a long way off, the overall option premium tends to be less responsive, even when in the money. Here's how that looks: If the option is in the money, the stock might make a three-point move, but the option premium might only move one point. In this situation, intrinsic value increases three points, but extrinsic value declines as an offset by two points. That's because expiration is a long way off, so there's more uncertainty about what the price might do. 2.When the option strike is close to the underlying equity's current price, extrinsic value tends to be less of a factor (assuming there is no change in the underlying's volatility). So the price will be more likely to follow the point-for-point movement in the money. That's especially the case as we near expiration. 3.The confusion between time and extrinsic value has led some analysts to assign characteristics to time value that are not accurate. All of the uncertainty in an option's current and future value is found in extrinsic value. Changes in value assigned to intrinsic and time value are well known and easily predicted. Now we've taken the mystery out of puts and calls, we are going to move on to profits. In next week's story we'll discuss not only what you need to know to structure a winning options trade but the ins and outs of basic options trading strategies. Editor's Note: I've seen firsthand over the years just how little people understand about options.